In 1959, no one would believe that Sunrise Poultry and Eggs on Elgin Avenue in Houston, Texas would start selling tail pipes and exhaust pipes for vehicles instead of processing chickens and selling eggs. 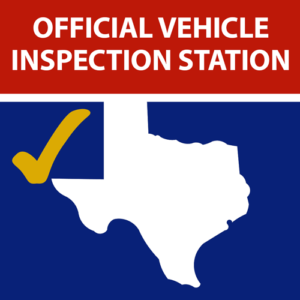 Today, no one can believe that the first place in Houston to sell performance dual exhaust kits for automobiles started out as a chicken processing warehouse. Originally named Southwestern Muffler, Southwest Muffler & Brake started as an independent muffler shop in Houston with a goal of providing superior service and quality products to all of their customers. L.C. 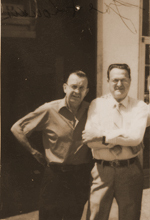 “Gus” Gostecnik bought his first trailer load of tailpipes and exhaust pipes in 1959 and sold them to local parts houses. Soon after his initial purchase, Uncle Gus moved into a warehouse and expanded the business. 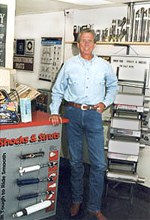 Lynn “Goose” Gostecnik purchased the company in 1977 and opened a second location under the name Brake Works. As a result of the daily on-site ownership, both locations soon became known as Southwestern Muffler & Brake Works. In an effort to modernize the brand but still maintain the original idea, Southwest Muffler & Brake emerged in 2012. Goose continues the family tradition of on-site ownership, and can be seen daily either swapping stories or sipping a cup of coffee with the customers. “I’m in both stores everyday,” Gostecnik says. This is something you will not receive at any franchise or the larger chains. We’re proud of our independence. Uncle Gus’s original idea of giving the customer convenient, immediate, one-day service using quality parts still exists.